When I see that one of my favorite bloggers has a 50% portfolio allocation to one stock I take note, even though the large allocation is partially the result of the stock already having gained ~500% the last year when it went from $0.50/share to $2.50/share. Nevertheless, my interest was piqued enough to do a little bit of research. HemaCare Corporation (OTCMKTS:HEMA) is emerging as a successful turnaround story. The company, focusing on blood products and services, deregistered with the SEC in 2012 after reporting losses for a couple of years. Since then they have sold all their divisions with the exception of the new bioresearch division that was started in 2013. The new business consists of selling cryopreserved human cells for biomedical research purposes all over the world (you can see their catalog here). “OneBlood is an industry-leading blood center that is known for its innovative and progressive approaches. Partnering with them provides HemaCare with an East Coast presence and at the same time brings validation of our evolution as a leading provider of a wide array of specialized blood products to the high growth biotechnology, pharmaceutical and academic research markets,” said Pete van der Wal, Chief Executive Officer for HemaCare. “In addition, we are also honored to have Bud Scholl, Executive Vice President and Chief Strategy Officer for OneBlood, join the HemaCare Board of Directors and look forward to his strategic insight as we move forward,” said van der Wal. While a partnership like this is probably pretty good news for the growth prospects of the company, I have no real way to quantify them. But what is interesting is that OneBlood also invested into HemaCare by buying $2.5 million worth of shares at $3.44/share. At the time of the announcement shares of HemaCare were trading at $0.65, so I think this is quite a strong statement of what the stock should be worth. Usually when a company issues a large block of stock it gives the buyers a good deal, and does it at a bit of a discount to the latest market price. Presumably the buyers already knew the (preliminary) results of 2016 while the market didn’t, but issuing shares at such a big premium can’t have be the easiest sell. The market price always acts a bit as an anchor point. Thinking that this means that the stock should be worth at least $3.44/share right now, just based on this transaction, is however also a bit optimistic. As part of the deal OneBlood also received warrants to purchase $2.5 million more shares at the same price, half of them expiring at the end of 2017 and half at the end of 2018. If you play a little bit with a Black-Scholes-model and use an implied volatility of 50% you will find that it’s perhaps better to say that they spend approximately $3.00/share to buy stock, and spend the remaining $0.44/share on the warrants. But OneBlood is not just a financier of HemaCare, they are also a partner in business operations. Giving a party like that a good deal, or even giving shares/options for free just to provide an incentive to make the partnership a success, makes sense to me. So the fact that OneBlood actually paid $3.44/share is in my opinion an incredible strong signal. So far I have just talked a bit about the story, but of course, that doesn’t really point us in a direction of how much HemaCare should be worth without combining it with some numbers. Since the remaining business is quite new it’s not that useful to look far back in the past. When we look at the historical income statements from 2013 onward we see that the company has made a remarkable turnaround, finally earning enough to cover fixed costs and make a small profit. However, it does seem that revenue growth is slowing. Growing fast from a low starting point is of course a lot easier than from a more meaningful revenue base. But also in absolute numbers growth has slowed down last year. In 2015 the company managed to grow revenues by $4.9 million, while in 2016 growth was $4.2 million. While growth appears to be slowing a bit I would still call these results pretty healthy, and they are accompanied by a balance sheet that is also looking good. I have adjusted the amount of available cash and the number of shares outstanding for the shares issued after the end of 2016. Thanks to the sale of their discontinued operations they already had a few million of cash on the balance sheet, and with the issuance of the shares to OneBlood another $2.5 million has been added. Presumably most will be required to fund growth. 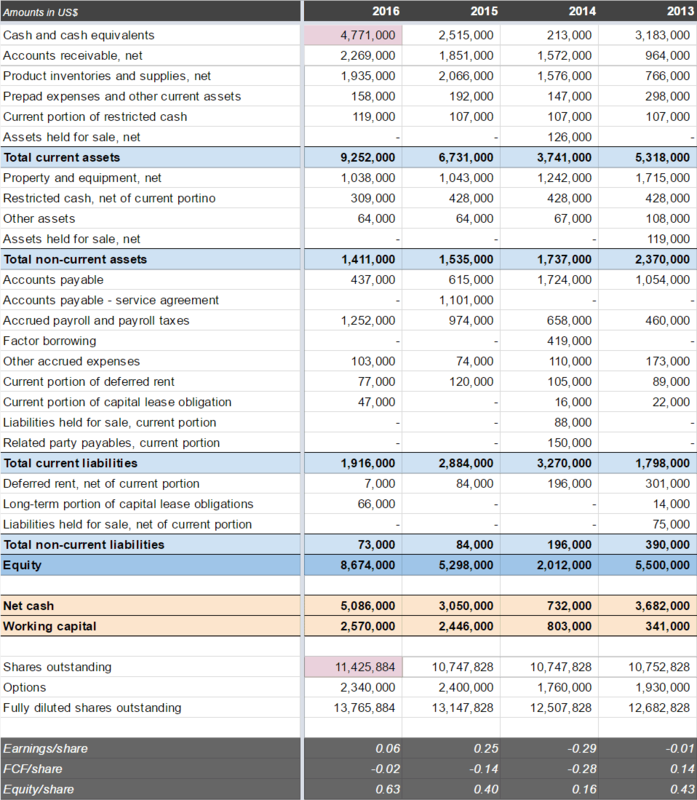 Based on the past few years, the business doesn’t require big capital expenditures to grow, but when you grow revenues that rapidly a lot of cash also disappears as working capital. I usually stay away from growth stocks, not because I don’t like stocks that are growing, but it’s usually just too hard for me to estimate fair value with a bit of confidence. Estimating what HemaCare is worth is also not an easy exercise, and you can get wildly different results based on what kind of model you use. Nevertheless, doing a little bit of simple modelling can give us some idea of the range of plausible values. 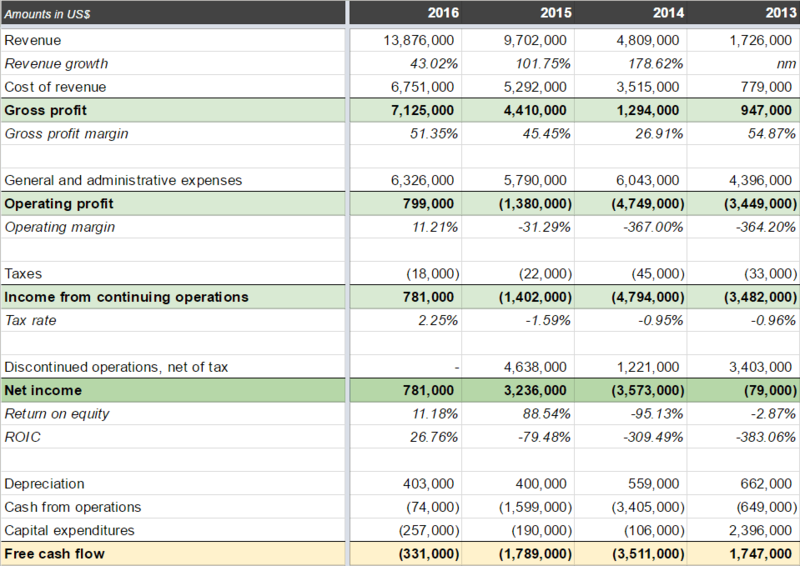 What I have done as a starting point is to assume that the company will be able to grow revenues by 40% while “cost of revenue” of “general and administrative expenses” will grow with the same percentage as they did between 2015 and 2016. This model nicely demonstrates the huge amount of operating leverage that the company currently has at the current point where it is just above the break-even point. Two years of 40% revenue growth sounds like an aggressive assumption, especially since last year growth slowed down a bit, but it’s basically a doubling in revenue for a company that in the past three years managed to increase revenues by a factor of eight. Since this year already started promising with the OneBlood partnership I don’t think it’s a pie in the sky scenario. What would be aggressive in my book would be to model high-growth for a way longer period. 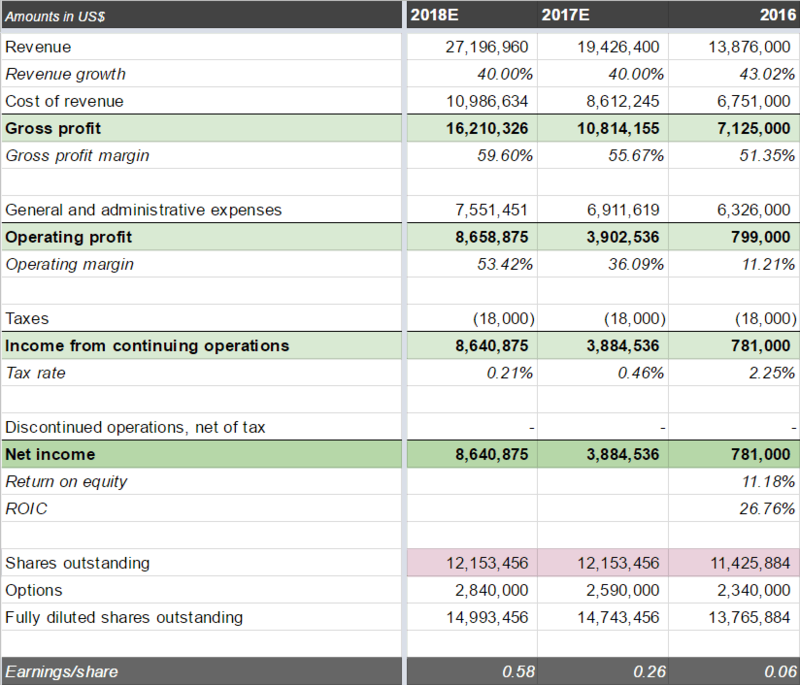 If HemaCare could double revenues net income would increase with more than a factor ten, thanks to the huge operating leverage that the company now has after just surpassing the break-even point. Given the high gross margins a large part of any growth in revenues now drops down directly to the bottom line since fixed costs are already covered. Note that I have assumed here that OneBlood will exercise their warrants to get another 727,572 shares, but that no additional shares need to be issued to fund growth. This would give the company $7.3 million in cash, which based on their current amount of working capital and historical capex requirements should easily be enough to support a doubling in revenues. I also assumed that the amount of options outstanding will increase slightly. In addition, the company will presumably also start generating free cash flow that can further support growth. Also noteworthy is that I have basically modeled zero income taxes. The company has some (small) net operating loss carryforwards that should be roughly enough to shield it from paying taxes the next few years (they have $6.0 million in federal and $2.9 million in state NOLs). So after 2018 we probably have to model that HemaCare will start paying a 35% tax rate. So how much is the stock worth today with these kind of assumptions? The question depends, of course, on what kind of P/E multiple HemaCare would be trading in 2018 if they achieve 2 years of 40% growth? I would say that a 15x multiple would be quite conservative, so with a 35% tax rate that would imply that the company would be worth $84 million. But we have to account for the fact that we have to wait two years for that to happen, and with a high-growth stock I think we also have to model a decent probability that this whole thing doesn’t work out. In that case the stock is probably worth very little or nothing at all. So I’m discounting the future value to the present using a 10% discount rate, and at the same time I’m assuming a 25% probability that the stock will be a zero (I know that this is a bit double, you could argue to simply use a higher discount rate, or just increase the probability of failure and use the risk free rate). By coincidence, I’m getting almost exactly the same value/share as the issuance price in the OneBlood transaction. I wasn’t trying to reverse engineer anything, but by ending up at almost the same number it increases my confidence of being correct. With the stock currently trading at $2.60/share that means that there is an upside potential of 31% to fair value. What’s perhaps less great is that the management team gets paid a decent amount of stock options. With a nano cap company it’s unavoidable to some extent that any option incentive program can cause significant dilution. I can only hope that with the recent strong increase in stock price the number of future options that will be issued will be decreased commensurately. A small positive that caught my attention in the 2016 annual report is that HemaCare spend $26,000 to repurchase 39,474 shares at $0.66/share. It’s not a meaningful amount, but it provides a hint that the company does know how to allocate capital. Even with their super high organic growth they couldn’t resist buying back some (extremely undervalued) shares. At current prices the case for repurchases versus investing in the business itself is less strong. HemaCare doesn’t appear to be trading at a huge discount to fair value. It’s for sure a stock that can be worth a lot more in a few years time, but it’s also not without risk. If growth stalls for some reason this stock can be in a lot of trouble since it just barely managed to get above break-even last year. But for a growth stock I think it’s more than reasonably priced. Often those stocks are priced like nothing can go wrong, but that is certainly not the case here. 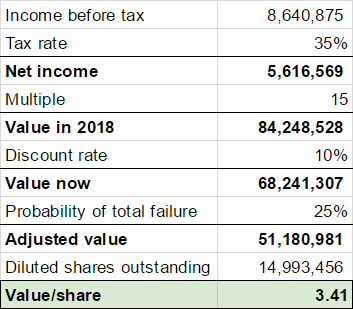 There is a bit of upside, and if anything, my valuation is a bit on the pessimistic side (modelling a 25% probability of the stock being a zero is quite punitive for example). Giving the very strong growth in revenue I think it’s actually quite unlikely that it will completely stall. Maybe it will slow down, but three years of 25% growth will get us to the same point as two years of 40% growth for example. There is more than one way to get where we need to get. What I also like here is that I have a very high confidence that the current price is too low, even though it is not by a whole lot. When a sophisticated buyer is willing to buy stock at $3.44 (~$3.00 accounting for the warrants) other market participants should be thrilled to get in on the same deal at a similar price. Because of that I decided to take a small position in HemaCare. This entry was posted in Portfolio and tagged HEMA on May 2, 2017 by Alpha Vulture. Can I know who are your other favourite bloggers? “upside potential of 31% to fair value.” could you explain then, the reason for purchasing this if it’s only a 31% upside? Thanks and sorry if I missed the answer in the article. The upside number isn’t very high, but my confidence that it is undervalued is. Pardon, you mean your estimated probability that the valuation gap would close? Or is it a qualitative call about the valuation itself? I guess a bit of both, but mostly the latter. I’m pretty sure I’m buying it at a good price, but of course the market can do whatever it wants, so the valuation gap could persist. But if you are sure you are buying it at a good price I think you should expect the valuation gap to close faster than average as well. Because often when you buy something that you think is cheap it’s simply not really undervalued, but cheap for a good reason. And then the perceived valuation gap can continue to exist indefinitely. What do you think Of HEMA after it bypassed your price target of~3.41? Even when reaching 6+ they are still cheap for Biotech at PE of ~11 and hugh growhth+ additional startegic agreement signed. I’m not sure how you get a 11x P/E, I wish that would be true! Adjusting for the fact that earnings got a one time boost by recognizing net operating losses, and that the company will soon have to start paying the full US tax rate it’s trading pretty close at a 30x P/E. I still like it though. It’s still a reasonable price for the high growth that they are delivering, but also not very cheap. Current market cap is $85 million. Based on 12.4 million shares outstanding and 2.4 million options. Examine the backgrounds of all the new board members that came on in 2015! !…your analysis was interesting…any update?